Welcome to our Saturday small business chat. Today it’s proofreader and editor time again – I know a lot of people who are thinking of going into this line of business read this series. So let’s find out what Lindsay McLoughlin, Proofreader has experienced as she set up her business. Interestingly, this series was already going strong when she set up – so another young company to follow! It’s always interesting to me to see how people have changed their business as it’s developed: I started out proofreading student dissertations and thought that was going to be it … little did I know. Lindsay’s experienced a similar pathway, although she has specialised a lot more than I have, to her advantage in her case, drawing back when she dipped a toe in the very waters in which I started off. It just shows how there is more than one way to grow a business – and in fact, we’ve all tried and rejected as well as tried and embraced different areas as we’ve gone along, I’m sure; otherwise, how do we know what to get into next? I set up www.proofedbylinds.co.uk in September 2011. I work with marketing organisations to polish and improve their web, print & publicity materials. I started out as purely a proofreading service. Since then, I have added two “departments” – editing and copywriting. I have a strong business background, a genuine interest in marketing and an innate love of words. With my youngest daughter going to school in September 2011, I decided to combine these three factors and offer a proofreading service to marketing specialists and business owners. I love to see how the words fit and work with each other on the page. Throughout my career, I have always been interested in making sure that everything is right. I was always the one in the office who people went to when they wanted their business materials “looked over”. I ran a sports goods distribution business with my father for eight years. He was the showman; I did the company secretarial work and the administration. However, when we started distributing in-line skates, I was responsible for all the related marketing and promotions. After that, I worked for an examination board. I set up and ran a marketing team. When we moved out of London to bring up a family, I registered as a childminder. I set up a childcare business which I ran when the children were small. It was good to have my own business again; childminding was a great way to spend time with my own children, as well as others. I learned a lot about my home town and I met a great bunch of people. How did you do it? Did you launch full-time, start off with a part-time or full-time job to keep you going …? Marketing and, in particular, written communications had been a theme throughout my career. This, combined with my eye for detail and genuine interest in words and how they are used, inspired me to set up a proofreading service. Don’t buy cheap business cards! One of my pre-networking actions was to organise some business cards. I saw a design online that I thought looked the part and conveyed what I did. I ordered a quantity in a regular size and on low quality card. At the networking meetings, I circulated the cards and collected others. I was getting the message that my cards were not of the same quality, but I was not yet sure how significant this was. At a networking training session, everyone in the room was invited to hold up cards that most appealed to them. Not one person selected my card – another indicator that my cards were not eye-catching. I then asked a graphic designer to design a new business card for me. She asked me a few questions to establish my tastes when it came to colour and images. She also explored my business values and – if my card could talk – what it would say. The result was a tasteful, attractive stylish design, printed on good quality card. It gives me a sense of pride when I distribute them. Networking on and offline is key to the success of a business. I was already an active Twitter and LinkedIn user, but active networking ties these tools together and brings you and your service to life. When I first started proofreading, I accepted one job that fell outside the business and marketing arena. I was asked to read a lengthy thesis within a very short timescale. I quoted for the project based on the number of hours that I anticipated it would take, not knowing that it was written by a foreign speaker. The result was that the job took longer than originally anticipated. The client was happy with the result, and I had met the deadline. However, I had not been in full possession of the facts. I was also operating in the student market which was not where I wanted my business to go. From that moment, I focused on what I do best: proofreading, editing and copywriting business and marketing materials only. I knew I could write; I had written for myself in a number of ways for years. However, I had never written for other people. A client called to ask if I “write” as well as “read”, and I suggested she try me out for size. 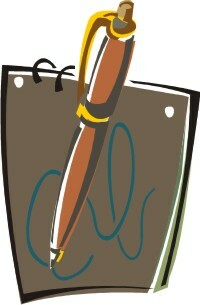 I became her “words person”; she had me writing newsletters, client testimonials, e-shots, case studies, training materials. This was my copywriting service coming to life naturally and organically. I have never been happier. One of the greatest tips I can give anyone before they take their seat on their networking rollercoaster, is not to dismiss anyone as irrelevant to you or your business. Just this week, a lady who – on the face of it – did not look like an obvious connection for me, asked if we could meet. When I followed it through, I found that – wearing a different hat – she writes subtitles for film scripts! The business has grown from one client in September 2011 to around a dozen clients frequently using all or some of my services, with more in the pipeline. My business is in its early phase. I am hoping to build long-term relationships with my clients so that they use my proofreading, editing and copywriting services regularly. I would also like to deliver a monthly newsletter to my client/business contacts database and to have a more sophisticated website. It sounds like Lindsay is already on the way to success, with some regular clients established. I remember what a relief it is when you get some repeat business – you know you’re doing it right, and you can grow that business and get recommendations from those clients, too. I have to admit that I do use the cheaper, web service, business cards, but I’ve been extremely careful about the design and quality, refining it over the years until I’ve ended up with something that I and other people like and which don’t look cheap. But if you can afford to invest in a graphic designer or can do a skills swap, as I did getting my images for this blog and my cover image for my e-book, it is definitely worth it. Lindsay can be found online at www.proofedbylinds.co.uk. You can email her, of course, or contact her via LinkedIn or Twitter.